This story is a fusion of three of the tales. The original versions of these stories didn’t have titles or named characters, but one account featured a haunted cashew tree, one was about how a Thakar girl outwitted someone by embedding a secret code in a song, and one centred on a watsu, a benevolent jungle spirit who would guide lost wanderers to safety. 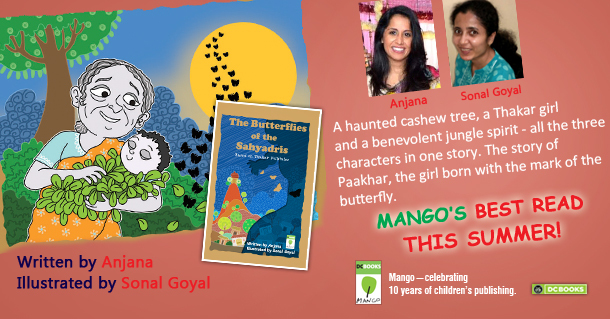 These three narratives have been tied together in the fictional story of Paakhar, a Thakar girl born with the mark of the butterfly. Since the members of the Thakar community speak a sort of pidgin Marathi, some of the vocabulary is identical, some words vary slightly. The Maratha warrior Shivaji, it is believed, bestowed that moniker on the Thakar community. A fitting title since the nomadic group would flit from one part of the jungle to the other, brightening up leaves with their palette of natural dyes, colours made from crushed stones and herbs which they filled into drawings outlined with a mixture of soot and oil. Shivaji recognised more than their talent for art, legend has it. The master strategist was quick to cultivate a small army of Thakar guptahe, spies who, while going door-to-door, singing and performing puppet-shows, would keep their eyes and ears open and bring him the vital information he needed to give his guerrilla force a killer edge. Another clever scheme of Shivaji’s was to have Thakar bards offer their entertainment services to rival troops that ventured into the area. Unsuspected, these adivasi musicians would thus be engaged to accompany enemy troops as they moved through the terrain. They were to sing and keep up the morale of the enemy soldiers. However, what the enemy did not realise, was that the Thakar songs were embedded with codes and signals that warned Shivaji about the whereabouts and plans of the intruders. moved away from that lifestyle in a bid to improve their lot and to gain acceptance in a society that once treated them like untouchables. While they were paid for their performances in food in the old days, for example, Thakar adivasis were typically given these on disposable banana leaves and coconut shells and made to cleanse the spot they ate at by smearing cow dung (deemed a purifying agent by traditional Hindus) over it. Stories such as these reveal a lot about primitive Thakar society, their social norms and ideology. Child marriage and polygamy, the practice of having multiple wives, seems to have been prevalent in the old days and daityas or demons, such as the one in the story above, were perceived as trouble some or angry gods, not monsters. Their stories are replete with accounts of humans interacting with the supernatural and though ‘wrestling with demons’ has an interesting allegorical ring to it, orthodox Thakars, even today, believe that these narratives are based on the actual, real-life experiences of their ancestors. It was not uncommon for protagonists to win such battles, outwit or overpower demons, and then befriend them. Themes were rarely didactic and when female characters featured in the stories they were either represented as greedy or as fonts of great wit and wisdom.